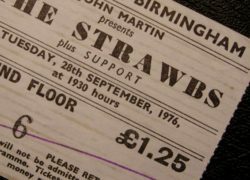 Item description: The Strawbs concert ticket for the 28th September 1976 concert at the Town Hall, Birmingham. White paper with black printing. Background to The Stawbs: The Strawbs formed in 1964 under the name Strawberry Hill Boys. 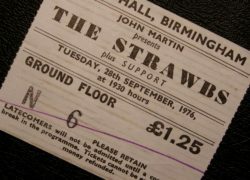 In June 1967 they changed their name to The Strawbs, after finding the name Strawberry Hill Boys was too long to fit onto a backdrop they were doing for a concert in Marlborough. They were the first UK group signing to Herb Alpert’s A&M Records and recorded their first single, ‘Oh How She Changed, b/w ‘Or Am I Dreaming’ in 1968, which was produced and arranged by two highly influential seventies’ producers, Gus Dudgeon and Tony Visconti. They also worked on the group’s critically acclaimed first album, Strawbs, which was released in 1969. Between the first and second A&M albums, in 1969, a rare publishing sampler was recorded (“Strawberry Music Sampler No. 1”). According to the 2001 CD reissue, only 99 copies of the original vinyl LP were ever pressed up, making it their rarest album, and one of the rarest rock albums for a collector to find today..
After the folk-tinged group added Rick Wakeman on keyboards, Richard Hudson on drums, and John Ford on bass, they became more rock inspired. The new line-up had their London debut at the Queen Elizabeth Hall, where Wakeman was trumpeted as “tomorrow’s superstar” by Melody Maker. Their third album, ‘Just a Collection of Antiques and Curios’, the first to have a US release, was taken from that concert. Wakeman stayed with them for one further album, From the Witchwood, then departed to join Yes, remarking to the press that “I’m sure we’ll all benefit from the split because we were beginning to compromise a lot on ideas — like we’d use half of my ideas and half of theirs — and I don’t think it was helping what was eventually coming out. We ended up lacking challenge. Complacency set in, and for the last couple of months we just weren’t working.” He was replaced by Blue Weaver, who had previously been with Amen Corner and Fairweather. This line-up produced what many feel to be the archetypal Strawbs album Grave New World, before yet another change, the departure of founding member Hooper, who was replaced by electric guitarist Dave Lambert, formerly of Fire and the King Earl Boogie Band. Lambert’s arrival in 1972 reinforced the group’s move towards a harder rock style on the next album, ‘Bursting at the Seams’. The first single from the album with Lambert on board, ‘Lay Down’, hit the UK charts at number 12, followed by a further single from the album, ‘Part of the Union’, which went up to number 2. The album also reached number 2 in the album charts and the band undertook a 52-date UK tour to packed houses. The harder rock style was also evidenced by Cousins’ solo album recorded that summer, with guests such as Roger Glover from Deep Purple and Jon Hiseman from Colosseum. However, during the course of a US tour, tensions came to a head and the Bursting at the Seams band did just that, with Hudson and Ford splitting off to record their own material, firstly as Hudson Ford, later as The Monks and High Society. Weaver also left the band, eventually finding a comfortable (and highly lucrative) gig with the Bee Gees; he also played with Mott the Hoople. Cousins and Lambert rebuilt the band, adding John Hawken (formerly of The Nashville Teens and Renaissance) on keyboards, Rod Coombes formerly with Stealers Wheel and Chas Cronk on bass. This line-up recorded the 1974 ‘Hero and Heroine and Ghosts’, and tended to concentrate on the North American market with relatively little touring in the UK. Signed to the Deep Purple-owned Oyster label, they recorded two more albums with two keyboardists replacing Hawken – Robert Kirby, also known for his string arrangements (notably Nick Drake) and John Mealing of jazz-rock group If. Coombes was replaced by Tony Fernandez (known for working on Rick Wakeman’s solo albums) for a further album, Deadlines, this time on the Arista label. Though recording was complete on a further album, Heartbreak Hill, featuring Andy Richards on keyboards, Cousins’ decision in 1980 to leave the band to work in radio effectively signalled the band’s demise, and the album remained in the vaults for many years.